Apollo 18 Blu-ray Review. Apollo 18 is an interesting movie, both thematically and visually. There are some good performances and a few good scares. It’s an interesting horror tale that falls just short of being an instant classic. I usually get excited when a ‘Moon movie’ comes along, mainly because there aren’t that many of them. That scarcity is strange, because the Moon provides a perfect setting, not only for Horror/Sci-Fi but for all forms of dramatic film-making. You have a severe contrast between light and dark, an eerie stillness, constant danger. 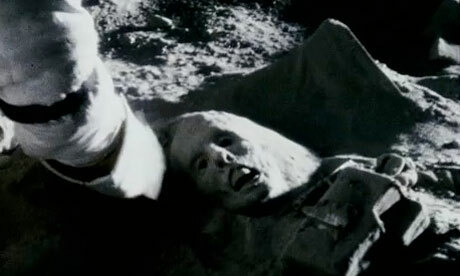 Apollo 18 is the latest film to try to capitalise on this creepy alien environment. It tells the story of a hypothetical ‘lost’ voyage to the Moon, said to have happened years after the Apollo program was officially scrapped. Three astronauts are sent into orbit, without public knowledge, carrying a secret payload to the lunar surface. Benjamin (Warren Christie) and Nathan (Lloyd Owen) are to land on the surface and set up the mysterious device, while pilot John (Ryan Robbins) holds the spacecraft in orbit and awaits their safe return. But the mission goes awry when, after depositing their payload, Nathan and Ben discover that a strange signal is blocking communications to Earth. Exploring on their own initiative, they find a bizarre trail- beginning with an anonymous set of footprints, and ending with an abandoned Soviet lander which looks to have been dismantled from within. The two return to their own lander, only to be attacked by some unseen force. Something gets inside Nathan’s spacesuit and wounds him, but afterwards Ben can only find a few dark shards of rock. Cut off from Earth, with his crewmate suffering from some kind of infection and increasingly irrational and violent, Ben does his best to get them off the moon, and home. The story as told as if it’s a lost piece of footage from the 70’s, and so is shown exclusively through the use of fixed and handheld cameras. It’s a technique that has become popular in horror movies, and used to good effect in Troll Hunter and Cloverfield. 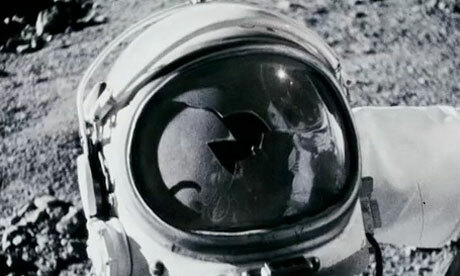 The fictional sequences are blended with real stock footage from the time, giving Apollo 18 a sense of authenticity. The sets are resplendent in every detail, looking for all the world like actual spacecraft, and topped off with some excellent lighting effects. A lot of work (and budget) has gone into special effects and CGI, which manifests itself when the monsters are on screen. These baddies are certainly grotesque and unsettling, but they’re not too far from the horror norm- nothing truly alien, or particularly terrifying. Thankfully, the actors themselves pick up the slack when it comes to providing scares. Lloyd Owen puts in a robust and frightening performance as Commander Nate. The period after he becomes ‘infected’ is easily the best part of the movie, brimming with tension as he slowly cracks up and loses his humanity in the confined space inside the lander. But the story itself hasn’t been refined quite enough, with the final sequence especially looking as though it’s been slapped together. In order to make this look like footage from the 70’s, the production crew have added all manner of effects and filters to the image. The picture is consistently grainy, is full of artefacts, and generally has a washed-out vintage look to it. The sound is equally convincing, with all the bleeps, whines and thuds sounding authentic. ?Deleted scenes: Some incidental dialogue from the characters. monologues by the character John Grey. 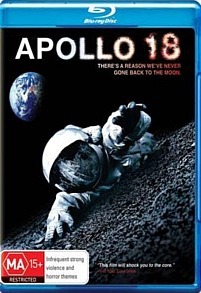 With its wafer-thin story, Apollo 18 falls short of being an instant cult classic. Nevertheless, it’s worth a look for some good performances and a persistently creepy atmosphere. Apollo 18 is an interesting movie, both thematically and visually. There are some good performances and a few good scares. It’s an interesting horror tale that falls just short of being an instant classic.